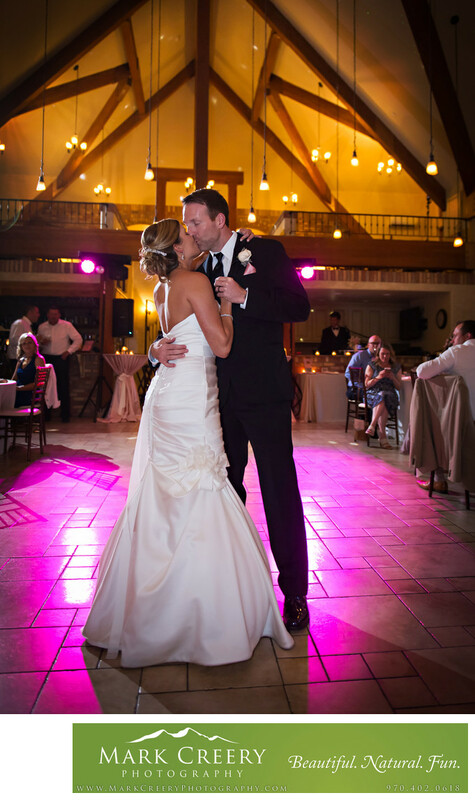 The couple share a kiss during their First Dance at their Della Terra wedding reception. When taking this photo, I wanted to capture the beauty of the ambient lights in the venue as well as the DJ lights, in addition to the couple having an intimate moment. I made sure to get down low to get as much of the ceiling as I could and made sure to get the right shutter speed to capture the light, with some fill flash to illuminate the couple. I also had an off-camera flash to the left of the image in the balcony to rim light the couple. I had to wait until I could see both of them as I was waiting in position to get the right composition, and they just happend to kiss when I was ready. These two had a great reception at a beautiful venue, filled with love and laughter.